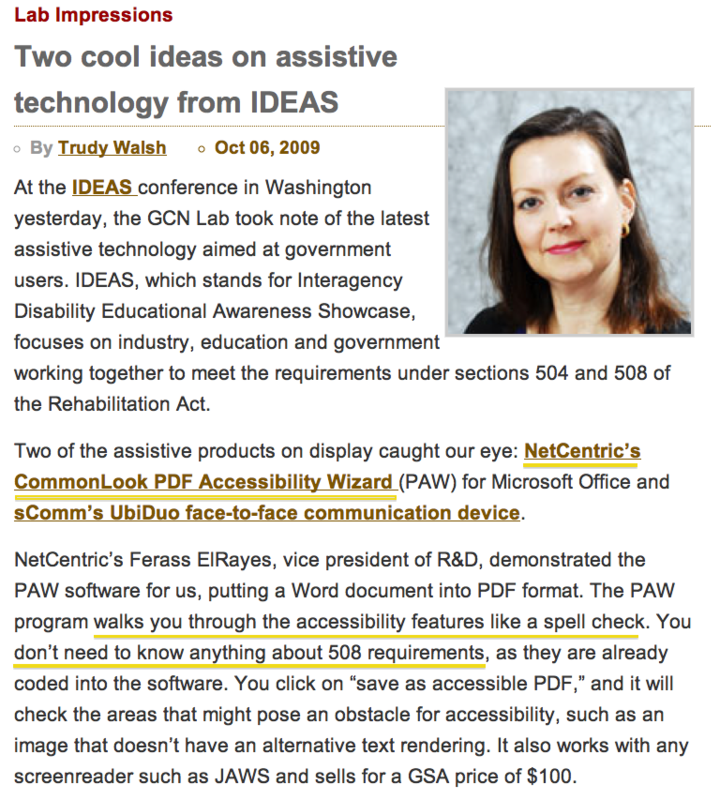 GCN Lab’s Trudy Walsh surveyed the offerings at the Interagency Disability Educational Awareness Showcase (IDEAS) conference, taking note of the newest offerings in assistive technology aimed at government users. IDEAS focuses on helping industry, education and government work together to meet Section 504 and 508 requirements. Two of the assistive products on display caught our eye: NetCentric’s CommonLook PDF Accessibility Wizard (PAW) for Microsoft Office and sComm’s UbiDuo face-to-face communication device. NetCentric’s Ferass Elrayes, vice president of R&D, demonstrated the PAW software for us, putting a Word document into PDF format. The PAW program walks you through the accessibility features like a spell check. You don’t need to know anything about 508 requirements, as they are already coded into the software. You click on “save as accessible PDF,” and it will check the areas that might pose an obstacle for accessibility, such as an image that doesn’t have an alternative text rendering. It also works with any screenreader such as JAWS and sells for a GSA price of $100. Read the full article on GCN’s website!